DeKALB — International Cambodian student I Younan An, who is also a senior political science major, proves anything is possible by becoming the first international NIU student to win the Lincoln Laureate award. An said he believes taking advantage of his time played a vital role in being honored with NIU`s Lincoln Laureate Award. The award is given to an outstanding senior from each of Illinois’ four-year universities for excellence in curricular and extracurricular activities, according to the Lincoln Academy of Illinois website. An grew up in a small town in Cambodia with his younger sister and parents, who made their money working as tailors. 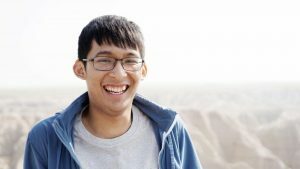 An said his parents had to drop out of school at a young age and survived the Cambodian genocide, which lasted from 1975 to 1979. He said they both worked long hours and did whatever they had to in order to feed the family. He also said a lot of his diligent characteristics reflect the work ethic his parents instilled in him. An said he started applying for many scholarships around the world when he was 12-years-old. He said a lot of his first applications were denied due to his young age, and his faith began to waiver. He applied for the exchange program run by the U.S. Department of State and coordinated by the Center for Southeast Asian Studies. An said every April the program selects 200 students and adult leaders from 11 Southeast Asian countries. He said from the 200, 20 are interviewed, and five are chosen for the program. He also said when he realized he was chosen to be interviewed, An did not expect it due to issues with low confidence. An said when he arrived at NIU at age 17, it was part of a three-week school exchange program through the Center for Southeast Asian Studies. He said during those first three weeks, he struggled with adjusting to a lifestyle that required him to utilize time-management skills. He said his lifestyle in Cambodia was very strict and structured and required little management on his end. He couldn’t wait to return to NIU after being accepted and knew it was the school for him. Along with the struggles, An said there were many benefits he acquired from the program and being educated through the Center for Southeast Asian studies. An said the Center for Southeast Asian Studies has been a tremendous resource in growing educationally and intellectually. He said the faculty at the center contribute to his continued success and ability to connect with fellow students in a huge way. “The community they provide for Southeast Asian students is second to none, and the openness of the faculty has allowed me to connect with American students interested in my culture,” An said. Un said working with An on his award-nominating project was enjoyable and really showed him how motivated An truly is. They are currently working on An’s thesis, which is based on the role of NGO in community development in Cambodia, Vietnam and Laos. Un said one thing he respects about An is his demand for continual learning and understanding of different cultures. Liz Denius, communications manager for the Center for Southeast Asian studies, said An is one of the most involved students she has had the privilege to get to know. Denius said An was honored Tuesday by being recognized as NIU’s outstanding international student in the division of international affairs. She said the award did not come as a surprise because of An’s constant thirst for cultural knowledge and a better understanding of the world around him. Denius said she got to know An on their ride to work together and said he is extremely easy to talk to. She also said he continues to grow as an accomplished student every day by working toward his goal of working for the diplomatic corps.